South Yorkshire data destruction specialists S2S has announced it has passed the one million mark for recycling mobile phones since 2014. 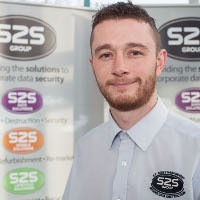 The announcement from the S2S Mobile Solutions arm of the business demonstrates how the firm has been helping to ring the changes when it comes to business attitudes to data security in an age when mobile phones are far more than just telephones, but information devices. S2S Mobile Solutions has recycled more than £1,000,000 worth of devices and accessories for its clients since 2014, highlighting the corporate mobile recycling specialists’ reputation in the market. Achieved through S2S Solutions unique mobile device recycling service, this allows corporate clients to achieve maximum value for their redundant devices, while at the same time guaranteeing the highest level of security. Tom points out that increasing numbers of business clients are turning to S2S, not just because they appreciate the speedy payment, but for the sheer usability of the bespoke customer portal, which makes booking collections a breeze. Yet the most important aspect driving repeat business is the confidence that S2S guarantee to completely wipe data and provide the certification to prove it. As data protection awareness grows, this element of the S2S service is becoming increasingly important to clients both old and new. S2S also granulated tens of thousands of mobile phones down to IA standard number five for clients requiring the highest level security solution for their redundant devices. Research from many sources show that the majority of us are blind to the data risks posed if we do not secure our handsets. Over half of UK adults think their phone and the data on it would be secure if lost or stolen, yet 86% had no security software installed and until recently, few businesses have really appreciated the risk of data leakage from redundant smartphones. While the message does now seem to be getting through, much more work remains to be done. “These figures were achieved thanks to the great work that everyone at S2S does – we’re extremely proud and looking forward to breaking the next milestone. With Corporate Clients updating their phones on a regular basis to keep up with the ever changing technology of mobile phones and tablets, we’re confident that we will have a strong finish to 2015 and continue this into 2016 to ensure we provide clients, new and old, with a guaranteed secure service,” concluded Tom.